You are seeing a 4 year old with a deep cheek laceration with irregular margins, under some tension. The parents express concerns about scarring, and they are also concerned that their child will definitely not be able to stay still for repair or for suture removal. Plastic surgery is unavailable, and the parents are amenable to having you repair the laceration with procedural sedation. Timely comment just posted on Ped-EM-L listserv: Wondering if anyone has any literature to support or oppose the use of wound adhesive as a “sterile dressing” on top of simple interrupted fast absorbing gut sutures? Anecdotally I have used it to “support” the relatively fragile 6/0 FA gut sutures with success. Interesting idea. 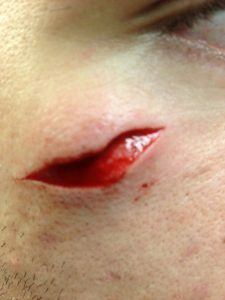 I guess I should have another choice – absorbable sutures with tissue adhesive on top. 6 week old exclusively breastfeeding jaundiced to level of chest, TcB 10, what lab work-up?